Homepage » Contact » News » Looking for CSM - Certified ScrumMaster training in English in the Czech Republic? Looking for CSM - Certified ScrumMaster training in English in the Czech Republic? 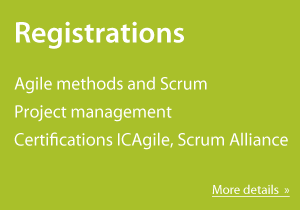 Join our CSM - Certified Scrum Master workshop in Prague, September 21-22, 2015. We regularly organize CSM classes and we’ve decided according to the high demand to make this class in English (if you prefer workshop in Czech, join us at August 20-21, 2015). The trainer will be Zuzi Sochova, CST. If you register until August 21, 2015 you will get discounted early bird price. Details about this certified workshop is at scrumalliance website.